So, I’m way behind on this thing. I do have a few posts coming in on essentially maintenance mode (one per week, set well ahead of time) so that I had the freedom to not look at a computer for awhile and be out looking for snakes. It’s been a tough year so far with the ultra dry conditions, but still one of what I feel is personal growth in regards to finding these guys in the wild. The role that photographing them takes has changed as well, and I’m happy that the world still seems to be completely wide open with this hobby of mine. I’ve come to realize this year that, with most of these species, I now am practiced enough that I could just go see one whenever I want (of course conditions being somewhat favorable), and I have more than enough photos of the same old diamondback pose to last several lifetimes sitting on my hard drive. I’m starting to favor taking less photos overall, and trying to do more to capture the environment and feel of the time/place of the observation than the animal itself. When I am hiking these days, my snake hook only serves as a walking stick, and very occasional annoying-blade-of-grass-mover to get a shot. The vast majority of animals photographed are disturbed not at all or very little. I don’t know, too much detail here? I’m just very happy that this thing seems to progress on its own. In a week I’ll be traveling to the Grand Canyon area to spend several days looking for 2 of the last 3 species of rattlesnake I have left to see in Arizona, before going to South Western Idaho to look for Western Rattlesnakes (and visit some old friends). I’m realizing that I have posted very little of my finds from the year, but I need something to do in the winter! I’ll try to throw up some of the backup and at least get the ball rolling, and hopefully that will make this blog at least seem a little bit alive while I finish up my season. I’ll wrap up this this bore-fest with a baby black-necked gartersnake, sitting as found on one of the driest days of the year. 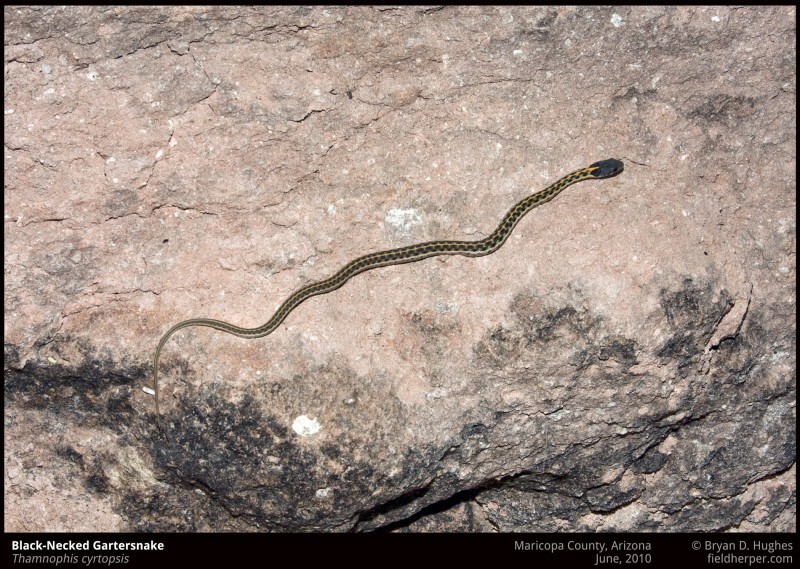 This entry was posted on Sunday, August 21st, 2011 at 8:14 pm	and is filed under Field Herping, Personal, Photography, Snakes. You can follow any responses to this entry through the RSS 2.0 feed. You can leave a response, or trackback from your own site.